"An attractive but simple design." "These basic metal over-the-door hooks can work in just about any place in your home." "Can hold up to five pounds, plenty for a purse, coat, towel, or oven mitt." "A great solution to add a lot of storage without drilling holes." "An easy add-on to hang one or two extra things." "Gives you lots of hanging power with none of the bulk." "If you want your hook to be just as much about looks as it is about function." "So cute kids will want to organize." With an attractive but simple design, six hooks for hanging power, and four good-looking finish options, this over-the-door hook is a great addition to a bathroom, guest room or kitchen. The multiple finish options (including on-trend copper!) mean that you can match the hooks to your other hardware, doorknobs or faucets, or you can choose a color that will blend in with the door to have it disappear for view. The six double hooks offer storage for bathrobes and towels, coats and hats, or even cleaning supplies in a kitchen pantry. It also comes in a three-hook option, if you don’t need quite as much storage or are using it in a smaller space. At less than a dollar per hook, these basic metal over-the-door hooks can work in just about anyplace in your home, including over pantry doors, garage doors, closet doors and in the bathroom. Because they’re single hooks, you can use them as a group or individually, and space them as close or far apart as you’d like, giving you versatile options for adding storage. They’re also great for places where you may want to add storage temporarily, like to make your home office a guest room for a weekend or in the winter when you need extra coat storage. Each can hold up to 11 pounds, which is a lot considering how small they are! If you want to install a hook onto your door without drilling, consider an adhesive hook. These stick to just about any surface, and when properly installed, can hold up to five pounds, which is plenty for a purse, coat, towel or oven mitt. (Just be sure to follow the directions exactly, including cleaning the surface first and allowing time for the adhesive to cure, so that they can work their best.) One big benefit that you don’t get with an over-the-door hook: You can mount these anywhere you’d like, making them a good choice to install lower down so children or someone in a wheelchair can easily access the door hook. Even though the hook is adhesive and made of plastic, the brushed nickel-look finish gives it the look of hardware, so it has more decorative feel that clear or white plastic. Whether you’re living a rental or simply don’t want to commit to a hook forever, an over-the-door-hook is a great solution to add a lot of storage without drilling holes. They’re also a great option if you’d working with a door made out of something other than solid wood (like aluminum or a hollow-core door) where screws might not holds. This multi-hook rack is a great option for kitchens, bathrooms and closets — any space where you might need extra storage. Because the 11 hooks are different sizes and placed at different levels, it gives you more options to store different kinds of items within a tighter space. Often, in the bathroom, you only need a teeny bit more storage — a space to stash a towel or robe while you shower or to hang it to dry once you’ve gotten yourself dressed. This classic double-prong robe hook offers just that: two gently curved hooks just deep enough for a towel or robe, in a simple and attractive design that will work with your existing hardware and fixtures without making too much of a statement on its own. Hang one or two on the back of the door for extra storage, and consider installing one at a lower level, too, if you share your bathroom with kids. Beyond working in the bathroom, it’s an easy add-on inside closet doors or the pantry to hang one or two extra things. The beauty of a swivel hook: It gives you lots of hanging power, with none of the bulk. This swivel hook has three prongs that extend up to 2 ¾ inches from the wall, deeper than many installed hooks, but lays almost flat when not in use, so it’s a great option for the back of a door you usually keep open, like a bedroom or laundry room door, when you want storage that won’t mark up the wall behind the door, or in any small space where even a few inches makes a difference! This one comes in three traditional hardware finishes as well as two fun colors, making it a good option for spaces from bathrooms to playrooms and anywhere in between. If you want your hook to be just as much about looks as it is about function, consider one of these cute birds! 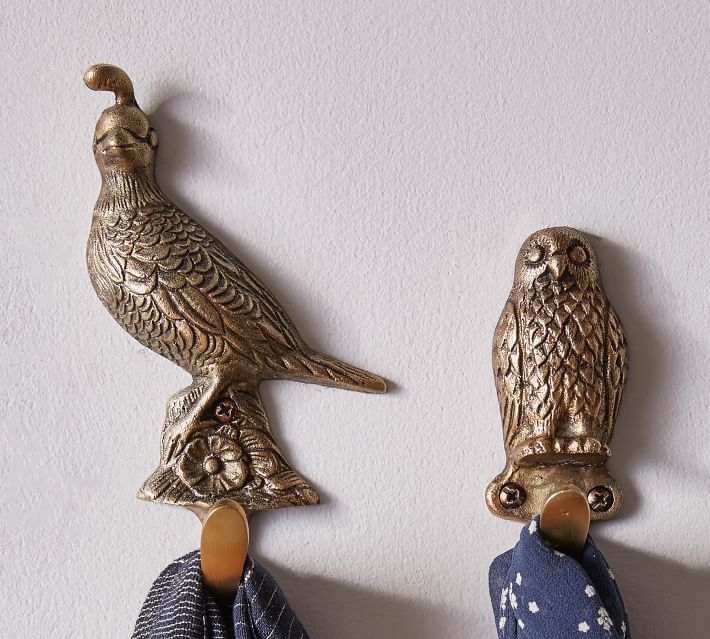 These sculptural hooks will look just as pretty on the front of a closet door as they will on the back of a bathroom door and can add functionality while serving as a decorative element, too. The birds have a versatile antiqued gold finish that works seamlessly with traditional interiors, as a happy contrast to modern interiors, or as a sparkle in an eclectic space. Buy them individually or as a set to mount on a door. They’re also pretty enough to act as little art pieces when they’re empty or to show off tomorrow’s outfit of the day. One of the best ways to get kids into organizing at a young age: Make it easy for them to put their stuff away where it belongs. Hanging hooks inside doors at your child’s eye level can be a great way to get them to put away backpacks and coats, for example, and will make it easier for them to get ready all by themselves in the morning. Or use hooks to hang up dress-up clothes, art supplies, towels or even bags of toys inside cabinet doors in their room or the bathroom so it’s easy for them to follow the “system” without help from their parents. This set of hooks is so cute they’ll want to organize! In the bathroom, consider giving each child their own color so they always know which washcloth or towel is theirs.